In October 2017, VRX Silica announced the acquisition of the Arrowsmith Silica Sand Project, located 270 kilometres north of Perth in WA. The project sits across five exploration licences totalling approximately 377 km2 adjacent to the Brand Highway and the rail connection to Geraldton Port, which is suitable for bulk shipping. Silica sand is the primary component of all types of standard and specialty glass and is also used for metal casting, metal production, chemical production, paint and coatings, ceramics, filtration and water production, and oil and gas recovery. Construction sand is the primary structural component in a wide variety of building and construction products. Preliminary reconnaissance work on the Arrowsmith Project indicated substantial potential for sand suitable for use in both glassmaking and construction, supplies of which are in increasing demand as a result of booming technology and construction sectors in the Asia-Pacific region. Arrowsmith South, prospective for high-quality silica sand. 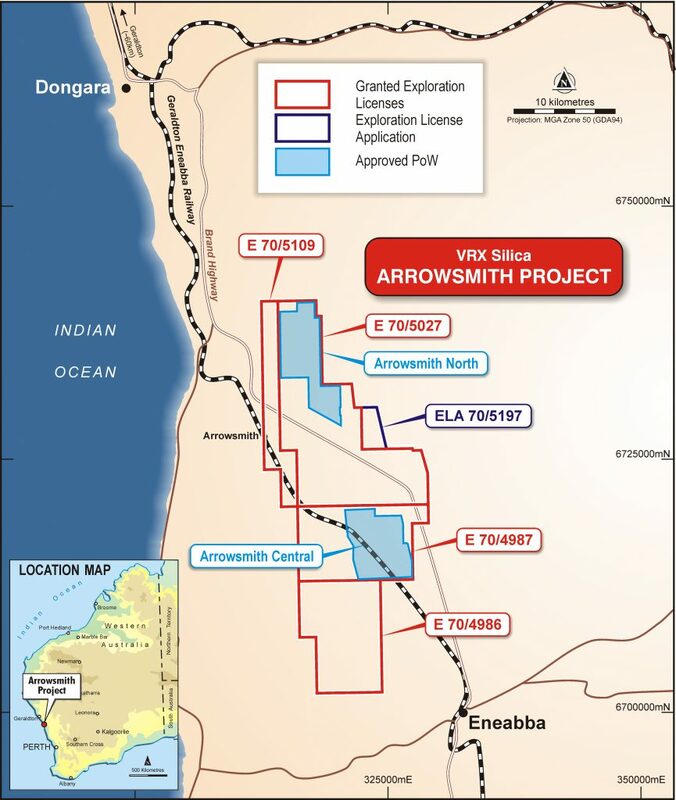 VRX Silica applied for three exploration licences north of Eneabba, Western Australia, which are shown below. The location is traversed by the Eneabba-Geraldton rail line, which provides direct access to the ship-loading facilities at the Geraldton Port and offers a unique logistics solution. As of January 2019, drilling over the project area has been completed by hand auger with hole depths ranging from 1.2m to 7m with an average depth of 3.8m. In October 2018, VRX Silica announced that CSA Global had estimated an Inferred Mineral Resource estimate (MRE) for the Arrowsmith North Deposit of 193.6Mt @ 98% SiO2, reported in accordance with the JORC Code 2012 edition. The MRE is based on the results obtained from 62 hand auger drill holes for 235.6m and defines two silica sand types; white and yellow sand, geologically logged and differentiated based on colour and through chemical analysis results. Based on metallurgical testwork completed to date, both sand types are readily amenable to upgrading by conventional washing and screening methods to produce high-purity silica sand product with mass recoveries. The high-purity silica sand product specifications are expected to be suitable for industries such as glassmaking. The project area is a substantial prominent dune system that has only been tested with hand auger. The Department of Mines, Industry and Safety (DMIRS) has granted a Programme of Work (POW) for exploration on the Company’s Arrowsmith North Project and additional drilling, using an aircore rig, is planned. This will penetrate deeper and is expected to add substantially to the maiden Mineral Resource Estimate. 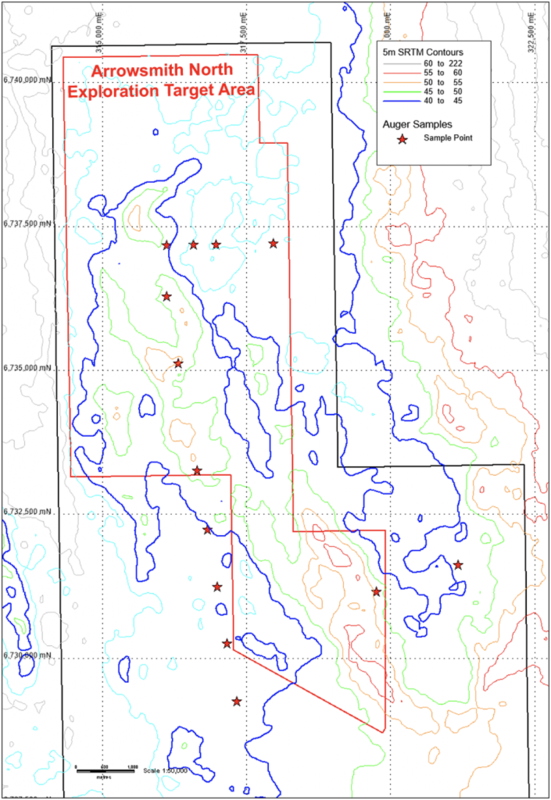 At the Arrowsmith Central Prospect, a maiden Inferred Mineral Resource of 28Mt @ 97.7% SiO2 was announced in December 2018, based on an exploration program of 39 hand auger drill holes. The Department of Mines, Industry and Safety (DMIRS) has granted a POW for exploration on the Company’s Arrowsmith Central Project and additional drilling using an aircore rig is planned. This will commence once the ground has dried out to conform with VRX Silica’s Dieback Management Plan, which has been accepted and added to the tenement conditions for the POW areas by the DMIRS. Exploration Targets for potential high-grade silica sand have been generated for two areas within the Arrowsmith Project; Arrowsmith North and Arrowsmith South. Arrowsmith North Exploration Target – 100 million to 140 million tonnes @ +95% SiO2. The Arrowsmith North Exploration Target focuses on a prominent broad dune structure, see above, and avoids existing infrastructure and potential conservation areas. The potential volume is estimated from the 40mRL (surrounding RL) to the top of the dune and assumes that between 70% and 100% of the dune is silica sand. The estimate uses an in-situ bulk density of 1.5t/m3 to calculate the tonnage. The target grade of +95% SiO2 is considered conservative as all samples, except two, taken from the area exceed this value and processing is expected to increase this grade. The potential quality and grade of the Exploration Target is conceptual in nature and there has been insufficient exploration to estimate a Mineral Resource and that it is uncertain if further exploration will result in the estimation of a Mineral Resource. 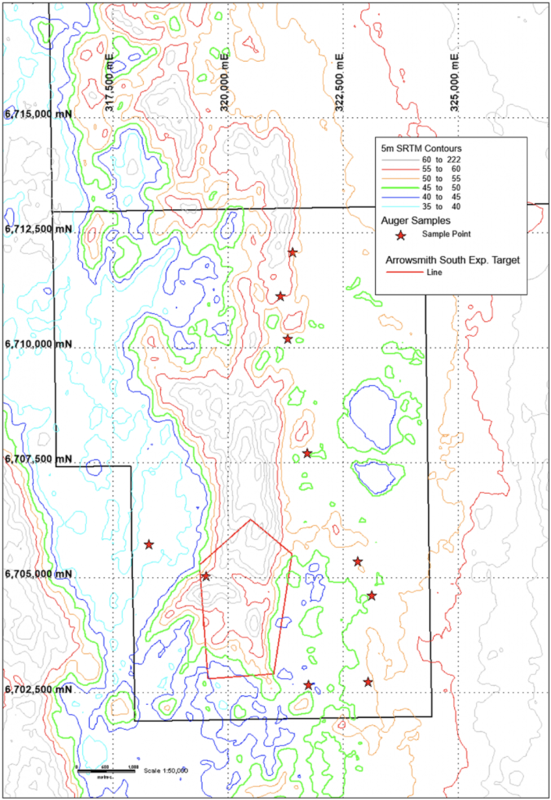 Arrowsmith South Exploration Target – 40 million to 80 million tonnes @ +95% SiO2. The Arrowsmith South Exploration Target focuses on the southern end of a topographical high that is noted as containing an intercalation of limestone and dune sands, see above, and avoids existing infrastructure and potential conservation areas. The potential volume is estimated from the 45mRL to the top of the dune and assumes that between 50% and 100% of the dune is silica sand. The estimate uses an in-situ bulk density of 1.5t/m3 to calculate the tonnage. The target grade of +95% SiO2 is considered conservative as assays from all samples taken from the area exceed this value and processing is expected to increase this grade. At Arrowsmith North, the Company has an approved program of works to infill the Inferred Mineral Resource with the intention of upgrading the Mineral Resource to category. This drilling will be done by an aircore drill rig, which will not have the depth limitations of the hand auger, and the full depth of sand will be drill tested. The drilling program will consist of 105 holes with an average depth of 11.3m (in comparison, the average depth of hand auger holes was 3.8m). The drill program is expected to commence early in 2019 due to limited drill rig availability and the requirement for native title heritage clearance. A further iteration of testwork at Arrowsmith Central has been commenced by CDE Global using a refined flowsheet to incorporate additional attritioning to further improve the quality of the potential final products. Process circuit design and engineering will then follow, allowing for capital cost estimates to be generated in the first quarter of 2019. The Company has an approved program of works and has completed a required heritage survey to infill and extend the Arrowsmith Central Inferred Mineral Resource with the intention of upgrading areas of the Mineral Resource to an Indicated category. This drilling will be done by an aircore drill rig, which will allow the full depth of sand will be drill tested.